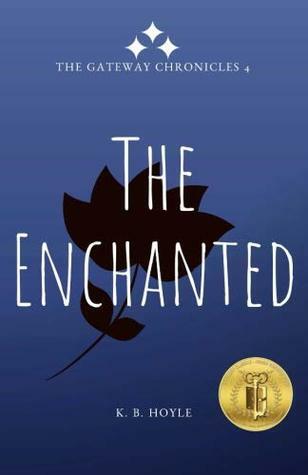 When I started re-reading this series, for the 3rd time, I couldn't wait to get to The Enchanted as it has always been my favorite book in the series. I didn't want to race through it, but I just can't put any of the books in this series down once I start. If I had this book in hand when I finished The White Thread I would've been a chain reader and picked it up as soon as I read the last word of The White Thread. The Enchanted starts with a prologue that gives us what happened immediately after the end of The White Thread. Then the first chapter jumps to the end of the school year and we get a glimpse of what regular life has been like for Darcy (and Sam and Lewis by default of living in the same neighborhood). And life hasn't been good as she worries about all that happened in Alitheia last year. Looking back at my original review of The Enchanted I stated that my reasons for this one being my favorite is because the characters are more mature and that is it more focused on relationships. When I read it this time, I struggled a bit to remember why it was my favorite and now having read my previous review I think I know why. I have stated in my reviews of these new editions, that the writing feels more mature, hence the characters feel more mature throughout. I think the first time I read The Enchanted it might have been the first time I felt it was truly a young adult (as opposed to juvenile fiction) novel. And two, the new scene I mentioned in my review of The White Thread. Originally, this was the first book we really saw Tellius and Darcy falling for each other. And I mentioned in my original review, this book had more of a feel of a fairytale. I'm not sure I had that same feeling this time around. Just like in my review of The White Thread where I can't say it is my least favorite, I'm not sure I can say The Enchanted is my favorite. I still loved it, maybe even a bit more than I did before. It is more like they are all now equally my favorite. I know I'm more focused on getting to my favorite scenes from each book this read through more so than the last time. As I said, in my review of The Six and The Oracle I like when different things stand out to me upon re-reading a book. 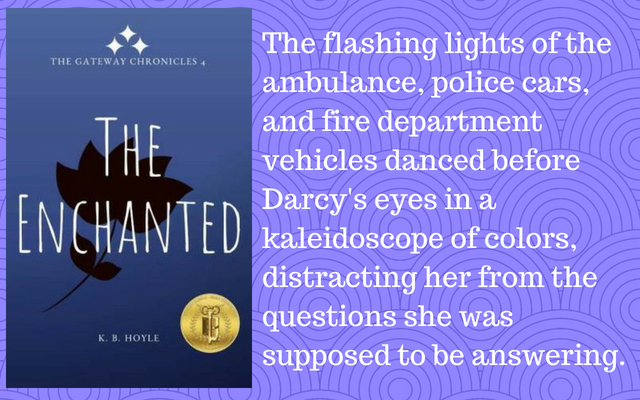 In the case of The Enchanted. I was more aware of two minor characters than before - Prince Cadmus, Tellius's younger brother, and Eleanor, their governess/guardian. "Lady Eleanor is in a delicate state and should not be physically accosted at this time." Darcy detected a note of gravity beneath his light tone. If you aren't familiar with this series, Eleanor was a part of Darcy's world (our world) until she was a college-age adult and Patreos gave her the choice to remain in her world where she was dying or she could live on in Alitheia. She chose the latter. Later in the book, Darcy and Eleanor are talking a bit about Eleanor's younger days. It really made me start thinking about how she came to Alitheia and started a bunch of questions swirling in my head. How did she become a trusted friend of the King and Queen? What were her first days like? Did Patreos give her all the knowledge of an Alitheia-born person or was she clueless? If she didn't know anything, who guided her? I was so curious that I had to ask Hoyle if she ever thought about writing a short prequel about Eleanor. Sadly, she said no. I can't say much about Prince Cadmus without giving away a minor plot point. Just suffice it to say even though I knew what was going to happen, I had tears rolling down my cheeks at Tellius's reaction. "Yes, yes, excellent." Cadmus stepped in front of Torrin and he, too, bowed. He winked at Darcy, and she was amazed how much he once again resembled his brother as he'd left behind his awkward adolescence. He'd changed greatly from the year before, and aside from curlier hair and a rounder nose, he looked almost exactly like Tellius had the last time she'd seen him. The similarity set her on edge, and she fiddled with the sleeve of her cloak. I can just see a mischievous gleam in his eyes and a bit of a smirk as he greets them so formerly. I think having these two characters stand out more made me love this book a little more than I did or maybe in a different way. I so love this series and have been tempted to start re-reading the whole series as I wait for The Scroll. I feel sorry for any books I read in between because I think they will all pale in comparison. I feel like an addict going through withdraws; I can't think about much else except for when will I get my hands on the next book (yes, I could just pull my copy off the shelf, but I really want to experience the new editions with fresh eyes). Are you reading this series yet? I am not familiar with this series. I enjoyed learning how your reactions changed on re-reading. This week I am featuring Second Chance on Two Love Lane by Kieran Kramer from my review stack. Happy reading! Isn't it amazing how much our feelings and thoughts about a book can change when we read it again? Some of it is because we've lost the element of surprise, but also we're in a different place a readers. I think Neil Gaimon has an excellent quote about it being like stepping into a river. You can never step into the same water twice. This is a new to me series, but I can see why you love it. I rarely re-read books and have and mixed results when I do. Some I end up loving even more, and some not so much. I hope you have a great weekend! I like books in series. Interesting how much our thoughts on a book can change when we reread at a later date. Always a good sign when you want to keep rereading a series over and over. Hope you enjoy your weekend! I also haven't heard of this series.Thank you for sharing and for visiting my blog. The book I shared this week on my blog is A Changed Agent by Tracey J Lyons. Shockingly I'm not reading a book right now because I finished one last night and was gone all day today. This won't be a reading weekend for me but I'm enjoying a busy weekend with friends and family. Hope you have a great weekend! "Tucking an errant group of hair behind her ear, Annabelle Giles planned out her morning." I don't generally read a book more than once, when it is then passed on to friends or family and I never see it again. However, I do have one or two books that I read and reviewed on one of the very early adopter review sites and I am now scanning through them again, trying to refresh my memory, so that I can post the reviews to Goodreads in a much more informed fashion. My current book is one such read and like yourself, as I scan the pages, I am amazed at just how much detail I missed the first time around and how differently I remembered the outcomes. Yours probably isn't a series I could get involved with, although I did enjoy the opening lines you shared. I did also go off and check out the earlier volumes, just in case I had misjudged the premise and thought it might have been better if the cover art had followed a similar theming throughout, although I do try not to judge a book by its cover. I like the different angle to reviewing something you've read before. I enjoyed reading how it read differently for you the second time around.